Reis Learning Center instructor Sam Hopkins, right, works with student Jessica Learson, 16, on a recent visit to the center. The Reis Learning Center in New Milford aims to foster confidence and success in students of all ages in the region. So says Jessica Reis, who owns the center that marked its fifth anniversary Thursday. 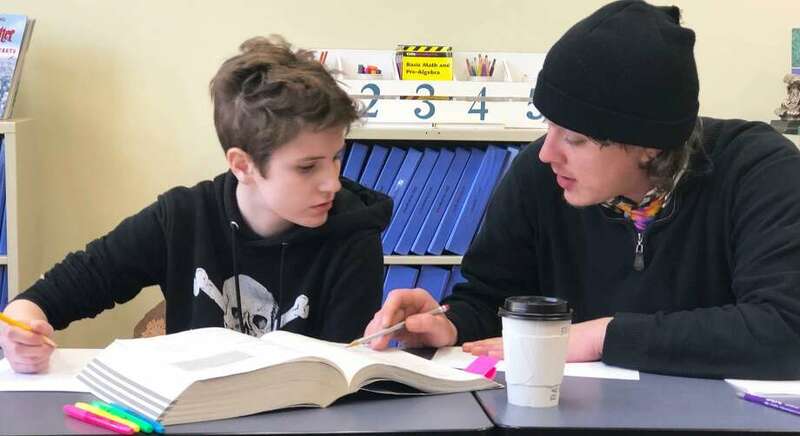 The center serves individuals of all ages, from kindergarten through high school, as well as adults, offering tutoring, exam prep, enrichment programs, one-time workshops and, new this year, scholarships. She said her staff members are “partners” — not authority figures — with each student and work with them to facilitate a healthy, positive and encouraging learning environment that promotes success. “Whatever their potential is, we are going to help them” unlock it, said Reis, who graduated from Pace University with a combined BA degree in psychology and a master’s in mental health counseling, and completed continuing education courses in applied behavior analysis. Phonics, reading comprehension and writing are among the areas of focus for younger students, while instructors often help older students with math and exam prep. Lisa Veloso, of Danbury, said her family reached out to the center for SAT prep and had a positive experience. Instructors will work with students on confidence building and facilitate the use of positive language. For example, phrases such as “I need help” instead of “This is too hard” are encouraged. Reis said students seek the center’s help for a variety of reasons. Some need to be taught in a different way than they are in a traditional classroom, while others need to work on skill building. “Jessica engages and takes the time to learn (the student’s) strengths and weaknesses and plans accordingly,” Veloso said. If more than one area needs to be addressed, such as handwriting and writing, instructors will address both in a “targeted way so everything gets proper attention….and the student can get proper reinforcement,” said Reis, who worked with children with autism for several years as an ABA therapist in Connecticut schools. “Going to the RLC has given (my son) a lot more confidence in math and other subjects,” said Sarah Adams of Kent, whose 11-year-old sought help in several areas. Over the years, the center has expanded its exam prep for tests such as SAT and ACT and added SSAT for private high school entrance and GRE for graduate school. Reis has also introduced several enrichment programs, including small group courses such as American Sign Language, summer classes and week-long workshops. The ASL program is comprised of educators who work with those who are deaf, hard of hearing or speech delayed, as well as individuals who are hard of hearing or deaf. Last year, elementary school students were invited to the center’s French and Spanish enrichment program. Summer offerings include hands-on and academic-based activities. Reis also partners with entrepreneurs who don’t have a brick and mortar store to offer one-night workshops open to the community. The newest addition to the center’s offerings are scholarships: one for students seeking first time entrance to a secondary education to a trade school, college etc. ; one for students seeking secondary education and are already enrolled in a program; and one for students entering high school.